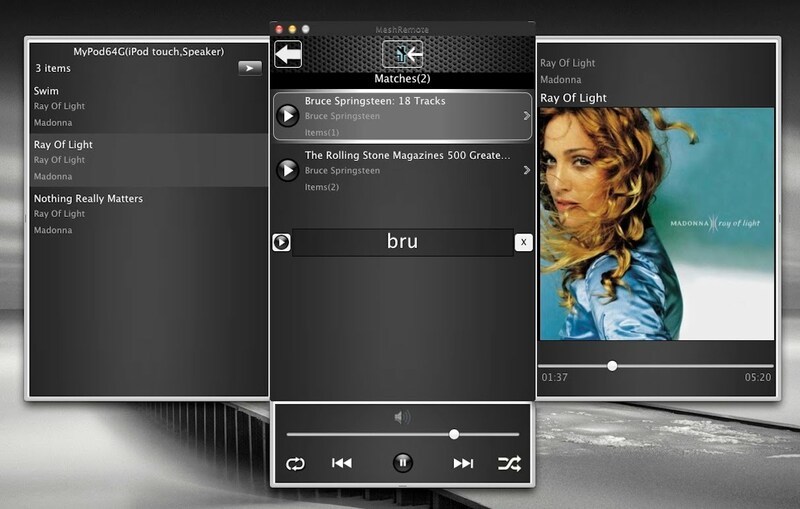 MeshRemote for Mac is a companion application for MeshRemote for iOS device. 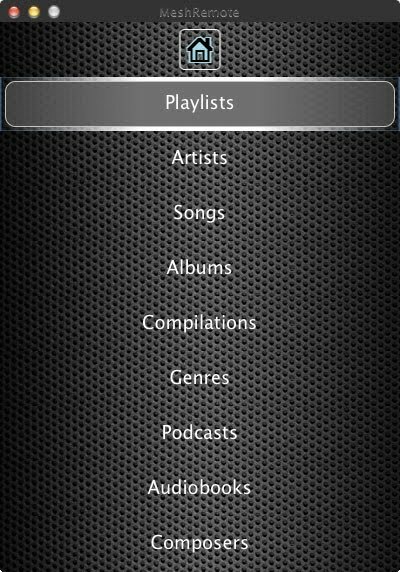 It allows you to remote control the iPod music library on an iOS device(iPhone,iPad,iPod touch) from a Mac. The iOS device must be running the MeshRemote app for iOS . 2) The app does support search functionality. Just press keyboard shortcut ⌘ F to open the search screen. Will put up a search button on the screen in the next update. 3) You can go to the browser home screen from any screen which displays audio items by clicking on the blue colored half home button. But your suggestion to include icons for albums,podcasts etc on the bottom of the screen is a good one. Will make sure that an update has that feature. - Quick switch from any screen which displays audio item to the browser home screen to choose a different category of items. Just click the blue half home button available in all screens which display audio items. -Items related to the currently playing items. Network which allows UDP broadcasts on a port specified in the MeshRemote app settings. This port is user configurable.